I promised not to torture you with boring policy drivel ("Questions," May 17, 2013). What follows is about financial regulatory policy, but I insist that it's neither boring nor drivel. Rather it's about a key and deep issue. Let's get right to it. The massive elephant in the room is, and always has been, the free insurance, or the free put option, or the bailout entitlement -- call it whatever you want -- associated with financial institutions with the coveted status of "too big to fail" (TBTF). Rest assured, there's no better way to incent financial institutions to take massively undesirable risks, with disastrous macroeconomic consequences, than to give them "get of of jail free" cards. Effete cognoscenti will yawn and note that this is hardly a new observation. They're right. Countless observers have been shouting for decades about the adverse incentives generated by TBTF. Gary Stern, former President of the Federal Reserve Bank of Minneapolis, and David Skeel, Professor of Law at the University of Pennsylvania, are two good examples. Take a look at their books here (Stern) and here (Skeel). The problem is that the shouts have fallen on largely deaf legislative ears. Indeed Dodd-Frank effectively institutionalizes TBTF through a nasty cocktail of government "partnership" with financial institutions, combined with discretionary government distress-resolution procedures. A nightmare scenario if ever there was. The same cognoscenti will now snap to attention and assert that Dodd-Frank recognizes TBTF's adverse incentives and thwarts them by increasing capital requirements and intensifying regulatory scrutiny. TBTF is no longer relevant, the story goes, because now we're regulating the large institutions so effectively that they'll never again be in danger of failing. Do you really believe that? That is, is there any real reason to believe that this time the rain dance will work, that this time we've fixed the TBTF incentive problem, that this time is different? I love good graphics, so I love Edward Tufte's work, and I'm always amazed by the number of allegedly quant-aware people who are actually unaware of Tufte. His beautifully-produced first book, The Visual Display of Quantitative Information, is surely the all-time masterpiece on elements of graphical style, not to mention a tremendously engaging and entertaining read. He opened my eyes, massively, to everything from avoiding chartjunk (a marvelous Tufte term), to thinking hard about aspect ratios, to thinking similarly hard about whether/why/how to use color. Indeed I admire Tufte so much that I occasionally find myself jealous. Why can't I be Tufte? Why can't I be the graphics legend with the stunning ET Modern studio in Manhattan? Why didn't Apple ask me to design the iPhone GUI? Damn that miserable Tufte. Tufte always says that Minard's Napoleon's March graphic, above, is the greatest ever. (Click here for detail.) Everyone else says that too, but they're just repeating Tufte. Notwithstanding the futility of "greatest ever" proclamations (except for rock guitarists -- it's clearly Jimmy Page, but that's another post...), Tufte might be right. Napoleon's March informs instantly, yet it simultaneously repays hours of careful scrutiny. It shows the French army advancing on Moscow (brown) and retreating due to the brutal winter (black), with path widths tracking the number of soldiers alive. It presents a huge amount of information compactly, telling a rich and textured story moving through space and time, beginning with bravado and devolving into disaster. 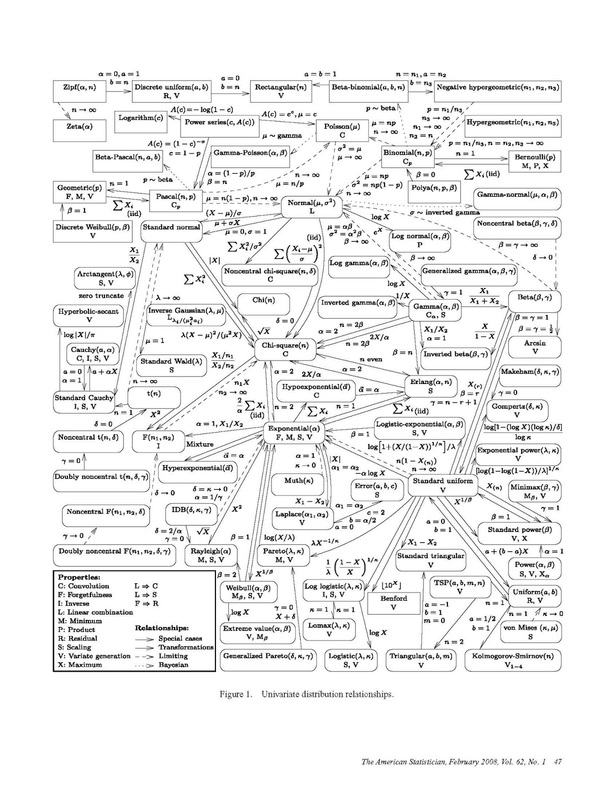 Now consider the Univariate Distributional Relationships graphic below, by Larry Leemis et al. (American Statistician, 2008). I learned of it recently from Oscar Jorda and Glenn Rudebusch, two fine and graphics-aware economics researchers. At first I thought it was a joke, a great example of in-your-face bad graphics, perhaps entertaining (unintentionally) but failing to communicate seriously. A better title, I thought, would be Nightmares of the Statistical Jungle. Now, a week later, I feel, well, the same. But I've also come to view the American Statistician version of Leemis et al. as something of a static straw man, chained as it is to the printed page. It turns out that the Leemis et al. web page has a much better dynamic version. Moving the mouse over the graphic, each distribution is highlighted, together with its immediate relatives. And moving the mouse over any of the distributions listed on the left of the web page locates it and its relatives in the figure, and clicking provides more detailed information. All told, the dynamic version of Leemis et al. is engaging and useful. Interestingly, consideration of Minard's Napoleon vs. Leemis et al. 's Distributions raises important and unresolved issues. Tufte's main mission is to describe how best to make "traditional" graphics, frozen on the static printed page, as with Minard's Napoleon, and his descriptions are of course also frozen on the same static printed page. But in recent decades the computer has catapulted us to dynamic and multi-layered graphics, with highlighting, brushing, spinning, clicking, etc., as with Leemis et al. 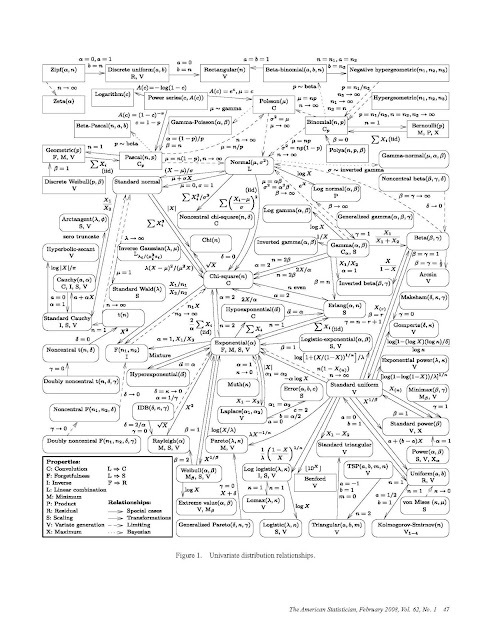 's dynamic Distributions. What are the key new principles of dynamic graphics, and how can one possibly describe them well in print? Tufte shrewdly skirts those issues in large part, leaving it to others to write a new "Tufte for the 21st Century." Pioneers like William S. Cleveland and his group at Bell Labs made early progress, and of course the modern dynamic graphics research program continues unabated. But it's still hard -- and it will always be hard -- to describe and discuss dynamic graphics insightfully on paper. Will there ever be a Tufte for the 21st Century? Is it even possible? What would be its format? (Surely not paper.) And what, precisely, would it contain? The good news, I suppose, is that we have 87 years to continue working on it. The scene at SoFiE 2013 leads me to reflect on structural vs. reduced-form modeling approaches in econometrics. Much financial-econometric work is reduced-form, whereas structural modeling has recently become fashionable in certain other areas of econometrics. The structure police, especially new recruits, are often fanatical. But the reality is that reduced-form "statistical" models are every bit as scientific as structural models. Structural models are simply restricted reduced-form models, and it's a delicate and situation-specific matter as to whether imposing structural restrictions on reduced forms is necessary or desirable. One key example, on my mind because it features prominently at SoFiE, is financial market volatility modeling. GARCH, stochastic volatility, realized volatility, whatever -- all such approaches are reduced-form, essentially autoregressive. Yet financial econometric volatility modeling has been hugely successful in both academic and industrial finance. It is now used routinely and productively in risk management, portfolio management, spot and derivative asset pricing, and more. And financial econometric volatility modeling is just one example. All told, for descriptive and predictive tasks in a variety of sub-areas of econometrics, reduced-form modeling often provides the best of all worlds, delivering major advances while avoiding structural modeling pitfalls. Greetings my friends, en route to SoFiE's annual meeting, in Singapore this time. If you're new to the Society for Financial Econometrics (SoFiE) (and even if you're not), please take a look and click on the links. SoFiE is a global network of academics and practitioners dedicated to sharing research and ideas in the fast-growing field of financial econometrics. It's an independent non-profit membership organization (check out the governing Council), committed to promoting and expanding research and education by organizing and sponsoring conferences, programs and activities at the intersection of finance and econometrics, including links to macroeconomic fundamentals. Its official journal is the Journal of Financial Econometrics, published by Oxford University Press. The annual SoFiE meetings rotate among the Americas, Europe and Asia and feature all aspects of financial econometrics. This our sixth annual meeting, so we've now been around the world twice: New York, Geneva, Melbourne, Chicago, Oxford and now Singapore. Check out the Singapore program and plenary speakers. We are most grateful for the impressive efforts of this year's local organizers, Jin-Chuan Duan and his fine team at National University of Singapore, and Jun Yu and his fine team at Singapore Management University. Jin-Chuan Duan leads the Risk Management Institute at NUS, and Jun Yu leads the Sim Kee Boon Institute for Financial Economics at SMU. Check out the SoFiE Facebook group, and visit its web page. You'll see other SoFiE activities as well. They include regional thematic SoFiE meetings (the last was at FGV Rio de Janeiro in December 2012, and the next is in Lugano in October 2013 on large-scale factor models, hosted by the University of Lugano -- more precisely The Faculty of Economics of the Università della Svizzera Italiana -- with additional sponsorship from the Swiss Finance Institute). SoFiE activities also include the annual OMI-SoFiE Financial Econometrics Summer School, thanks to Neil Shephard's entrepreneurship (the last was July 2012 in Oxford at the Oxford-Man Institute (OMI), as is the next, July 2013 on Financial Forecasting featuring Andrew Patton and Allan Timmermann). On the web page you'll also find information about membership. The Society benefits from the invaluable support of both a core group of institutional members and hundreds of individual members. Please consider joining the Society. We'd love to have you! Speaking of ideal environments, how could I have forgotten blogging environments in my last post? Daughter 1: Dad, why are you doing a stupid blog? Me: I'm not sure. And it's not stupid. And thanks for your support. Daughter 1: And why are you doing your stupid blog using stupid Google Blogger? Me: I'm not sure. And thanks for your support. Daughter 1: No cool bloggers use Blogger. Only old people who don't know any better. You should use WordPress. Me: What are you talking about? What's WordPress? All my blogging friends use Blogger. Daughter 1: They're all old people who don't know any better. Daughter 2: Don't listen to her, Dad -- Blogger is perfectly fine and totally cool. In my experience regarding e-matters, the youngest is generally right. So Daughter 2 (age 14) wins -- for now I'm staying with Blogger. I'm delighted to learn that Blogger is cool, and that by implication I'm cool.